The recent visit of Russian Defence Minister Sergei Shoigu to New Delhi has imparted a fresh momentum to the burgeoning defence ties between India and Russia and set the stage for the fast-tracking of defence deals. India-Russia defence relations were re-energised during the recent visit of Russian Defence Minister Sergei Shoigu to New Delhi. Shoigu participated in the 14th meeting of the Inter-Governmental Commission on Military and Technical Cooperation, and met India’s Prime Minister Narendra Modi and Defence Minister Manohar Parrikar. The meetings underlined the urgency to add synergy to the defence relations. The defence ministers of India and Russia agreed to fast-track the resolution of defence issues, resolve irritants, and expedite the finalisation of contract for Fifth Generation Fighter Aircraft (FGFA). They also discussed the joint production of military helicopters. India is particularly keen on the fighter aircraft, and as per the reports it was supposed to invest $5.5 billion initially, but the final cost may be about $25 billion. There are bottlenecks related to design and delivery, and it is hoped that the fast tracking will help finalise the contract. Russia has been India’s largest supplier of defence products, and in 2013 it exported weapons and military equipments to the tune of $4.78 billion to its strategic partner. Since India’s independence, Russia has been a steady supplier of defence products to India, and has come to its aid in difficult times. Shoigu and Parrikar agreed that terrorism is a big threat, and it is an imperative for the two countries to cooperate to fight the menace. Both the countries have already formulated joint declarations to fight terrorism, and have formed joint working groups in this crucial area. Shoigu invited his Indian counterpart to participate in the 4th International Security Conference to be held in Moscow this year. Shoigu and Parrikar shared the view that ‘double standards’ to fight terrorism must be avoided. Whether it is security of their territories, or issues of extremism in Chechnya or Kashmir, or the security of their multiethnic and pluralistic societies and cultures, Russia and India have much to gain with joint cooperation. The international security conference may provide both the countries another venue to develop a multilateral mechanism to counter the scourge. Joint military exercises are another hallmark of India-Russia defence relations. Indra series of military exercises, and other such joint ventures, have facilitated an exchange of expertise between the forces of the two countries. Shoigu invited India to participate in the Military World Games, the regular Tank Biathlon Championship and the ‘Air Darts’ competitions to be held in Russia this year. These exercises will help the Indian forces to be combat-ready, and also help in sharing of experience between military specialists from both sides. Prime Minister Modi, during his meeting with Shoigu, recalled his meeting with Russian President Vladimir Putin in December 2014, and called Russia a ‘pillar of strength’ and India’s ‘most important defence partner’. During the visit of Putin, a number of agreements were signed between the two countries. Both the countries had also discussed FGFA and military helicopters. The joint production of defence items will be significant for the success of Modi’s “Make in India” campaign. BrahMos is a shining example in this regard, but it is necessary to have joint design and production of more defence items. Unless the defence deals are expedited, stagnation will take over and the relations will suffer. Modi will visit Russia this year to participate in the 7th BRICS summit, and also to participate in the annual bilateral summit. While the BRICS summit will strengthen the relations and emphasise the evolving multipolar global order, the bilateral summit will witness new agreements. It is expected that by that time the FGFA deal will take a concrete shape. One can also expect progress in case of military helicopters, navel projects, and in developing a roadmap for building more nuclear reactors in India. In the competitive world, the mantra of success entails resolving differences and finalising deals in a mutually advantageous framework. Other countries such as the US and France are vying to meet India’s burgeoning defence requirements. It is likely that during the forthcoming visit of US President Barack Obama, India and the US will sign a defence agreement. But Russia has nothing much to lose as it has an age-old, strategic, and trusted relationship with India. India and Russia need to sort out differences, deepen cooperation between defence officials and finalise the deals. 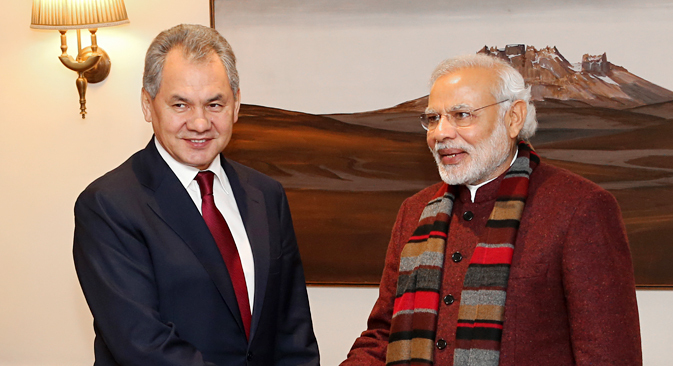 The visit of Shoigu is a positive sign and will help accelerate India-Russia defence relations across the spectrum.